Why is gambling addiction dangerous for players? Factors that lead to slot machines addiction. How to prevent gambling addiction and play for fun? 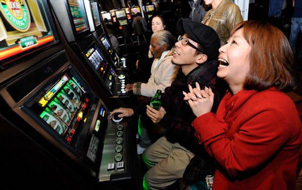 There are many casinos to gamble at and even pubs and bars where the gambling is available. Although, the law restricts gambling in many areas there are online casinos and even mobile gambling, so the doctors are concerning about the psychological health of people who are fond of casino games and slot machines. There is very slight distinction between a gambler who can control the playing and a gambler who is not able to stop playing. It is quite important to take under control the flow of the game. Playing slot machines is one of games that can lead to gambling addiction as slots are the games of pure chance. So, a gambler wants to try one and one more time. Besides that slot machines offer great prizes that reach millions of dollars. But it is necessary to remember that machine is not to pay out and if you are losing at slots today, it is better to try another type of casino games. When gambling becomes addiction, the player is considered to be ill and need treatment as he is not able to control the wish to play. In this case players often waste more than they can offer. It leads to they start borrowing or even stalling money, that results in personality disintegration. There are a lot of reasons for uncontrolled gambling from psychological point of view. Some scientists think that players cannot quit the game because there is a deep psychological necessity to lose money as a kind of punishment for unsolved problems in their lives. Others are sure that wish to requite for losing and win back money lost previously. It is a big mistake as in this way the players just increase the house edge. There are also gamblers who are chasing big rewards. They spend a lot of time and money playing progressive slot machines in hope to become a millionaire. But remember that slots are games - not a style of life or a way to earn easy money. In order to avoid gambling addiction and losing money, you can play online free versions of slot machines and participate in online slot tournaments that are free of charge or require very low entrance fee. In this way you will be able to play your favourite games and avoid losing money. One more idea is to buy a slot bank that is a small prototype of slot machines. They give the feeling of real slot game and save your bankroll.